I realized today that I have one month to finish preparing for the presentation that my co-speaker and I are giving at #Safety2017 in Denver, CO on June 20, 2017. The slides are pretty much squared away and we submitted a companion paper to the American Society of Safety Engineers (ASSE) Professional Safety journal. We are just waiting to hear back on whether the article was accepted. If you'll be attending Safety 2017, we'd love to have you attend Session 537: Practical Tools for Gender Equal Protection in OSH Programs from 1:00-2:00pm on June 20, 2017. 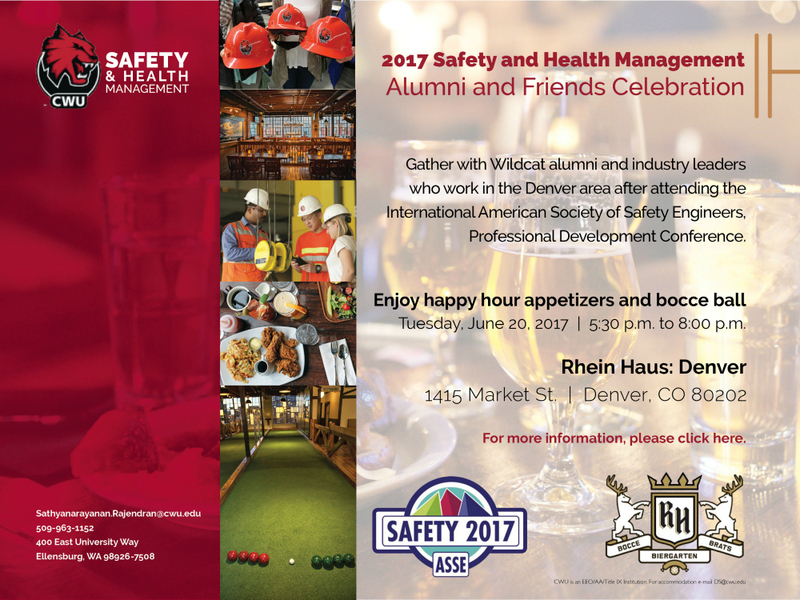 If you're an alumni or supporter of the Safety and Health Management (SHM) program at Central Washington University (CWU), there is a celebration/networking event scheduled for June 20, 2017 from 5:30pm to 8:00pm at Rhein Haus in Denver (see e-invite below). The "real" evite is on LinkedIn on the CWU SHM page and on our CWU SHM website. We are having this event because my colleague, Dr. Sathy Rajendran, is being presented with ASSE's Outstanding Safety Educator Award at Safety 2017, and I am being presented with ASSE's Industrial Hygiene Practice Specialty - Safety Professional of the Year Award! So it's going to be an amazing conference. I also get to see my friends at #AIHce2017 in Seattle - I can only attend the Expo, but hope to be able to catch up with my colleagues, former clients, and mentors. Since it is nearing the end of the academic year, I had to compile a list of all the service, scholarship, and teaching activities that I have been working on since starting at CWU in September 2016. Here's the short version of the list. Presentation at Pacific Northwest Section (http://www.pnsaiha.org) of the American Industrial Hygiene Association (AIHA) during the 2017 Spring Symposium on "Using Continuity of Operations Planning to Improve Your EH&S Program"
I will (as promised) be bringing Piper Pangolin and perhaps one other member of the #sockpuppetsafety team to Safety 2017. We hope you will #talksafetywithus and #geekoutaboutsafety with Piper and the Industrious Hygienist. Look for more videos soon!